"This is one of my favorite recipes. Great for brunch or special occasions. My mother would prep this on Christmas Eve Day and let it set overnight, then bake it Christmas morning for a simple but decadent dish. This is great for keto or LCHF diets, or you can use turkey breakfast sausage to reduce the fat." Heat a large skillet over medium-high heat. Cook and stir sausage in the hot skillet until browned and crumbly, 5 to 7 minutes. Drain and discard grease. Spread a thin layer of Colby-Jack cheese in the bottom of the prepared baking dish. Crack eggs on top of the cheese layer and break the yolks but do not stir. 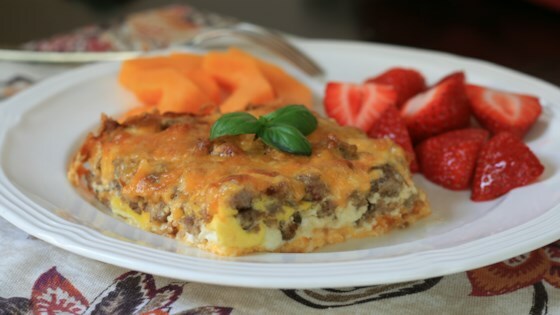 Layer crumbled sausage over eggs and top with remaining cheese. Drizzle cream on top. Cover baking dish and refrigerate, 8 hours to overnight. Bake in the preheated oven until set, about 1 hour. Let stand for 10 minutes before slicing. This breakfast is truly the bomb! I love this recipe. Absolutely delicious with so few ingredients. I will be making this often! This will be my go to for potluck breakfasts. It’s so easy! And loved by everyone! Even made it for a football tailgate and it was a favorite! Now, I make it on a regular basis! Fantastic! I also only made half a pan and cooked it for 40 mins. I did lightly salt the eggs and used half hot/half not sausage. So easy and yummy!